A long awaited re-legalization of mandatory inclusionary zoning looks likely to make it to Governor Kate Brown’s desk this Spring, opening up the possibility that Portland could see some council actions by late 2016 to deal with the housing crisis. But before we see any laws passed that require housing for lower-income Portlanders, council could require more mandatory housing for cars in parts of the city. Up to 20% of units must be affordable to 80% median income household. Parking must be provided to no less than 20% of units and can be required for 33% of units in large developments. Developers can avoid building any affordable units if they pay an in-lieu fee" Developers can reduce requirement by no more than 50% through various measures. City must provide financial incentive to developers who build "mandatory" affordable units. Cost of parking space construction, maintenance, and opportunity is passed onto tenants. Applies to new construction containing 20 or more units. Applies to new construction containing more than 30 units, with two additional tiers which trigger additional parking requirements. Could lower rent on average 2 bedroom apartment by $400. A structured parking space can easily add $200 to monthly rent. Underground parking costs much more. 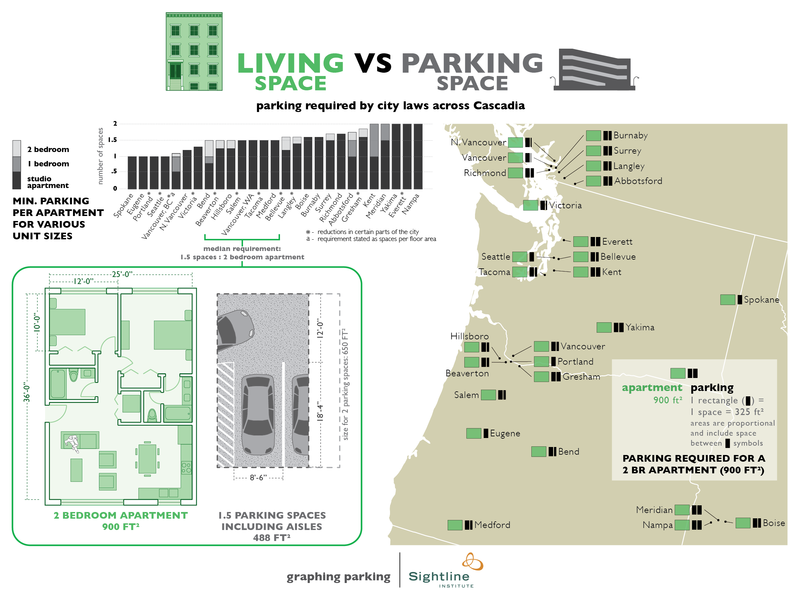 Portland is facing a housing crisis and applying the existing minimum parking requirements to more areas of the city will lead to higher rents in new apartments and will likely lead to less housing being built. our knowledge the city has not performed any studies on the affect of 2013’s zoning changes to require more parking. Minimum parking requirements work at cross purposes to affordable housing policies. City Council and the Bureau of Development Services should work to reduce or remove minimum parking requirements rather than impose new ones. Managing our on-street parking supply with improved residential permit programs can ensure the right amount of parking is built by developers and not a space more.